It’s easy to dismiss home renovations that aren’t absolutely essential as “frivilous,” but sometimes making things a little nicer than they have to be is a good move. For one thing, you’ll enjoy the increased comfort, and for another, choosing the right “splurges” can really make a difference when it’s time to sell your home. With that in mind, let’s take a quick look at a few of these splurges that might make sense for your home. Steam showers have become a fairly significant trend across the country. A lot of homeowners have moved away from large soaking tubs because of the expense of heating and using all that water. Instead, many of them are opting for a nice steam shower. Unlike saunas, which use dry heat, a steam shower envelops you with comforting, warm, moist air that’s gentle on your respiratory system and penetrates deep into sore muscles to relieve strain and stress. Some of the benefits of a steam shower can include clearer skin, better circulation, and stress relief. Heated floors? In Florida? You bet! If you’ve ever had the AC cranked up in your house, you know what it’s like to step out of the shower or bath onto a cold tile floor. Heated floors are a pleasure after a shower or bath—especially if you have aching feet. And they don’t use a ton of electricity, either. Nobody likes a dark, dreary bathroom, but sometimes you may be limited when it comes to windows. What if you want to let more light into your bathroom—without having the neighbors looking in? Glass tiles can be a beautiful and practical solution. Most higher-end homes have done away with the old shower curtain in the tub/shower. But an increasing number of homeowners are also not enamored with the glass and aluminum doors that replaced them. They constantly need cleaning and just don’t add much to the look of the room. 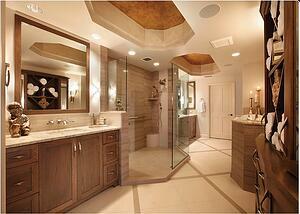 Frameless shower doors operate better and look fabulous. It takes a bit of planning (and good execution), but you’ll love the results. Are any of these suggestions absolutely essential? No, but you’ll enjoy your master bathroom more. And if you decide to sell your home someday, these improvements will get you a high return on your investment.